Ugh! I just wrapped up a full audit. And, let me tell you, it was awful. It drug on for over 6 months. It costs me literally countless hours spent on hold over the phone. It required a lot of effort on my part to remedy errs, and not my own either. Time and time again, the IRS lost paperwork that I had sent over not once, not twice but THREE times. The only saving grace in the entire situation was the fact that I had prepared my taxes correctly initially and that I had prepared all of my paperwork in advance just in case this should happen. I couldn’t (and still can’t) afford an expensive attorney to help, so I was forced to go it on my own. But it can be done—and successfully so—if you prepare yourself in advance. Below are just a few easy and inexpensive ways you can prepare yourself for an audit in advance and save yourself a headache, time and quite possibly a tidy sum of money, too. Envelopes are unbelievable helpful. Whether you use large manila envelopes or just the plain, long white ones, envelopes immediately give you a place to tuck and store receipts all year long. These receipts can literally be out of sight and mind and then stored along with a copy of your tax return for your records. Should Uncle Sam ever come a knocking, that little envelope—and more importantly, its contents—will be literally priceless. You’ll have the records to substantiate things such as business expenses, doctor visit copays, prescription costs and the like. Word to the wise, if you’re going to claim it on your taxes ensure that you either have a paper record of it or can easily get it in the future. Keep copies of all your worksheets. You may not have to file them with your taxes, but those little worksheets you fill out that are inside the instruction booklet are just as important. If you don’t want to store the entire instruction book, at least tear out the worksheets (and possibly the instructions for it). If you’re called upon later to justify figures you supplied, those worksheets can be vital. Consider storing old calendars for particularly taxing years. (No pun intended!) If you’re a small business owner or a sole proprietor, this should be standard practice. But even if you’re not, it can still be valuable advice. Did you sell a home? Purchase a home? Did your child attend therapy visits? Did someone in your family have surgeries? 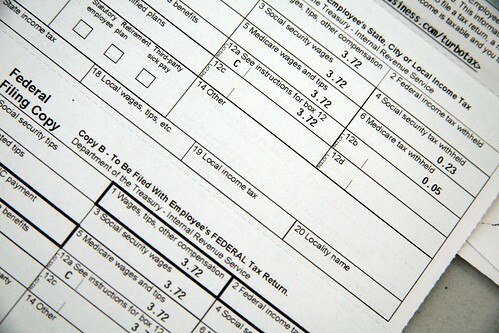 If it’s been a busy year overall, it’s likely going to be a more complicated tax year as well. If you’ve lost a record of some kind, an old calendar may be just the key you need in order to help secure another copy. You’ll immediately know what to look for and where to go to get it. Take the time to take notes. Got a receipt that’s for a legitimate deductible expense, but it’s not readily identified on the receipt itself? Make sure you jot down exactly what it’s for on the receipt itself. Imagine if months go by before you look at the tiny slip of paper again. Are you going to remember exactly what it was for? Do yourself a favor now—and quite possibly later—note it now so you’ll know it later. You may be tempted to pitch a receipt now and again simply for convenience sake, but resist. You never know when a $5 or $10 receipt may make all the difference. Glad you had copies of all your forms. I know so many people that would be doomed if they were ever audited.